Homemade potato chips are delicious! You can slice them super thin or thicker to give you more of a kettle chip. I use a Salad Shooter brand contraption that takes the tedious work out of slicing them (believe it or not, my Gram did this by hand). These units usually come with a thin and thick slicer so you can take your pick. We usually do the thin ones, though so keep in mind that they will need to be cooked longer than the thin cut potato slices. Wash and peel your potatoes--or don't. 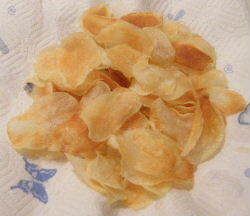 Some people like the skin on potato chips and it certainly is easier if you don't have to peel them. I, however have a finicky daughter who will not eat the skins, so I peel. Put the potatoes in cold water and place them in the refrigerator for about an hour. This helps them get crispier when you fry them. Run the potatoes through your slicer and put them back in cold water. Again, if you made them thicker (like a 16th of an inch or more), remember to adjust your cooking time. Fill your deep fryer with oil to the fill line and heat to 325 degrees. I use a lower heat so they don't get too brown. Also, ready a pan (I use a pie tin) with a thick layer of paper towels to drain the fries when you take them out. When your fryer is ready, take approximately 2 handfuls of potatoes out of the water and blot them with paper towel. Put them into your fryer basket, separating each slice as you layer them into the basket. Then down into the hot oil for about 5 minutes. This can vary a little depending on the type of potato you use, how thick the slice is and how many you put in the basket. A good rule of thumb is to take them out when you see them getting a little brown. When you take them out, shake the basket to drain off as much oil as you can, dump them on your paper toweled pie tin and salt them right away. No need to put them into a warmer, you really don't serve them hot and you want the grease to drain off. Start your next batch in the deep fryer. You can dump each new batch on the same plate until you're done. My favorite dip for the homemade potato chips is the horsey sauce recipe. Click here for more great potato recipes like Homemade Potato Chips!